INNISFIL – A new elementary school in south Alcona will be busy the day the doors open. Land for the new school was set aside after the Simcoe County District School Board asked the Ontario Ministry of Education for funding last fall. The ministry’s announcement Tuesday approving not only the new Alcona school south of the 7th Line off Webster Boulevard, but also an addition to Victoria Harbour Elementary School, came as good news to Steve Parker, the board’s manager of design and construction. “It’s about the whole south end of the county. We’re having a hard time keeping up with the growth. So yes, it’s a good day,” Parker said. 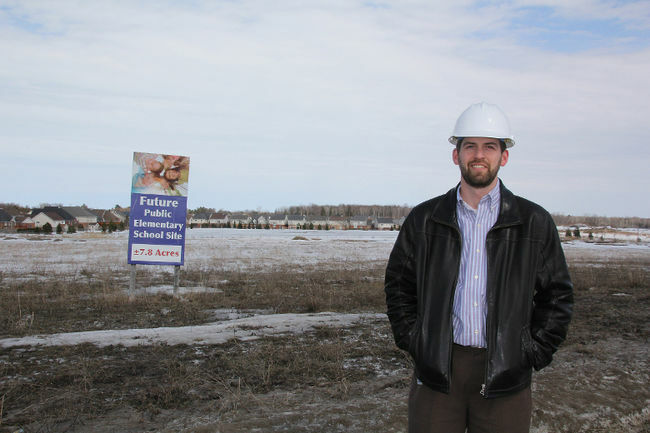 Standing beside the still mostly snow-covered approximately 7.8 acres of land, new houses springing up in Alcona surround the site for the new school. Board spokeswoman Alison LaMantia said Goodfellow Public School and Alcona Glen Elementary are at capacity, and are currently using portables for the extra students. “Goodfellow has 150 over capacity now,” LaMantia said. There are six portables at Alcona Glen and another four at Goodfellow. Alcona Glen has a capacity for 621 but has 817 students, while Goodfellow has 656 students with a capacity of 509. Parker said the ministry will advise the board of their capacity allotments, and then they’ll begin the design stage and obtaining permits from the Town of Innisfil. Although there are no firm opening dates, he hopes to begin building next spring and open for fall 2016. The Victoria Harbour school’s expansion will include classrooms, but LaMantia said they also hope there’s funding for a gymnasium and a library. The new Alliston Union school will be built along the same time frames, Parker said, and added construction of the new Chris Hadfield school will begin in Bradford next week. As Innisfil mom Kory Bell packed her two small children – as well as a neighbour’s child – into her minivan in Alcona, she said she was thrilled to hear of a new school for the small village that’s tripled in size during the last two decades.